This is just a quick follow up, linked to my previous blog post about Lexikaliker’s investigation into the Vietnamese Mono 100s1. If the Mono 100 is now made in Vietnam then it shouldn’t come as a surprise that the Mono (without the 100) is now made in Vietnam, too. 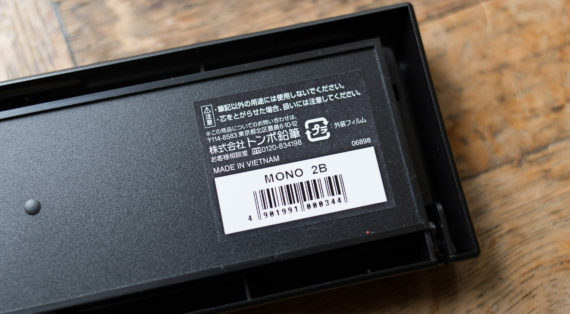 I would have liked to compare the Japanese and Vietnamese Mono, but everywhere where I thought I’ve seen a non-100 Mono in our house it turned out to be the similarly looking Dong-A Fable2, a pencil that has made a few appearances on this blog since 2009. ‘diparaging slang-term “homo” became well-known in Japan’ (Tombow Pencil 100 Year History Project Committee, 2013:p.38). 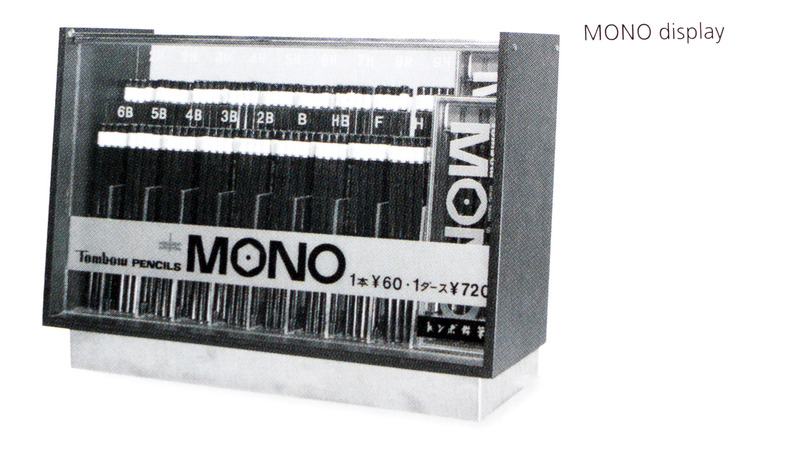 In 1967, for Tombow’s 55th anniversary, the Mono 100 followed ..and two years later there was a Mono eraser, too. I don’t want to bore you with more details, but if you’re really interested, let me know in the comments and I’ll write up more when I have time. Tombow Pencil 100 Year History Project Committee. (2013) The 100 Year History of Tombow Pencil. 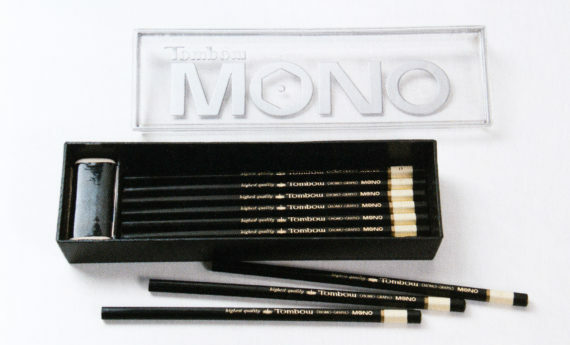 Tokyo, Tombow Pencil Cp., Ltd. I bought this dozen straight from Japan and paid just under £9, I think. Unless otherwise stated pictures in my blog are taken by me. Well, this is one of those ‘otherwise stated’ occasions. The pictures marked as such are from Tombow’s book “The 100 Year History of Tombow Pencil”. In January 2015 Tombow Europe granted me permission to use them in blog posts. 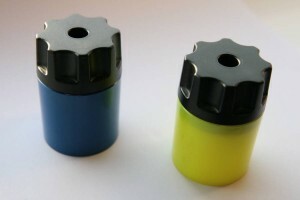 Last time I visited Selfridges, they had the Robot Pencil Sharpener from Kikkerland on a shelf. I recognised it from Dave’s Mechnical Pencils, but I am sure I have also seen it in other blogs. Of course I could not resist and was drawn to it. Next to it there were also some other novelty pencils and eraser, including big dinosaur shaped erasers, Penguin Book pencils and paper pencils. 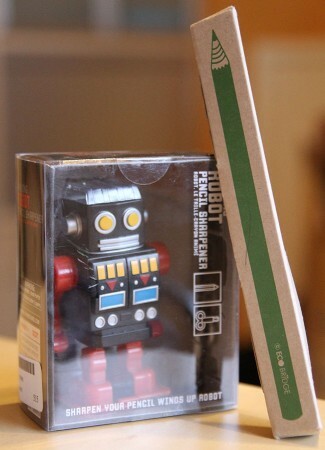 This being Selfridges the items were not cheap, but I still bought the robot sharpener and the paper pencils. The paper pencils are from a company called Eco Bridge and are made in Korea. I paid £3.95 (~ $ 5.95, ~ € 4.40) for three pencils. The price in Korea is 2300 Won (~ £ 1.35, ~ $ 2.00, ~ € 1.50). Not cheap, especially when keeping in mind that until recently Tesco sold similar pencils made from rolled Chinese newspaper for less than 5p (~ 8¢, ~6ct) each. 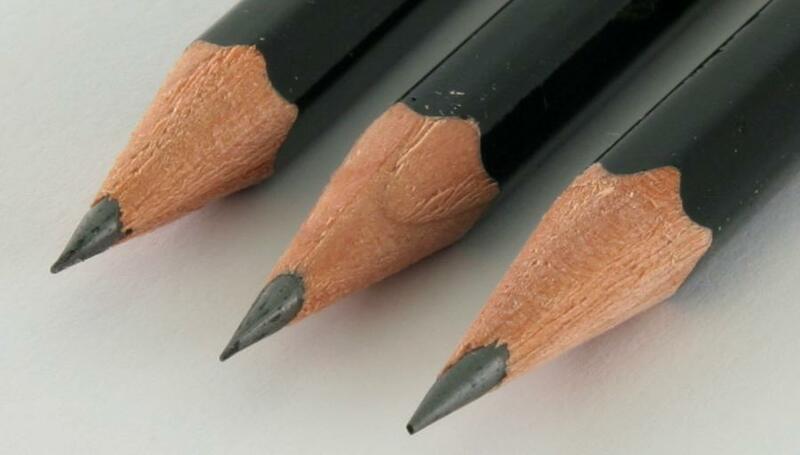 O’Bon’s newsprint pencils, reviewed at pencil talk, cost $5 (~ £ 3.30, ~ € 3.70) for a pack of 10. 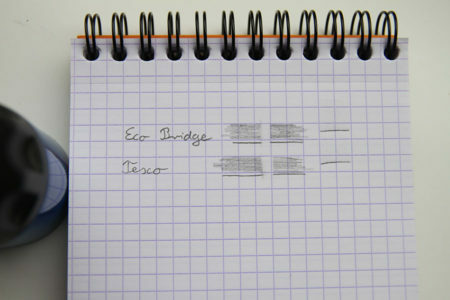 The Eco Bridge pencils is definitely softer than the Tesco pencil or the average European HB pencil, its softness is comparable to a Staedtler Mars Lumograph B, Faber-Castell 9000 2B or Palomino HB. Smudging is similar to other pencils of this softness. To my surprise the Eco Bridge is a very good pencil. It is much smoother than a Dong-A Fable HB, one of the few pencils from a Korean company that is, as far as I know, produced in Korea. I normally prefer pencils where the point stays sharp for longer, but softer pencils like the Eco Bridge have the advantage of delivering a nicer, darker black when writing. When it comes to sharpening the pencils the Tesco pencil performs better than the Eco Bridge. The blade of the sharpener (in this case the Eisen 402) seems to cut the Tesco paper much better, while the paper in the Eco Bridge is more likely to get ripped away. While the paper used for the Tesco pencil is rolled paper with Chinese characters on it, probably from a newspaper or something similar, all three Eco Bridge pencils have a similar colour distribution on the paper, red in the middle, near the lead, and recycling beige on the outside. I suspect that the paper used for the Eco Bridge has been recycled and printed on specifically for this pencil, in order to produce this pattern on the paper. This would also explain the higher price tag. This recycling process might be responsible for the rougher paper, compared to the Tesco pencil, which results in the paper ripping easier. The Eco Bridge is not cheap, but it is a nice pencil. It might not be able to compete with really good pencils, but it is better than most “average” pencils. If you like B or 2B pencils and happen to see the Eco Bridge pencils in a shop you could give it a try. On the other hand this money would (nearly) buy you one of the good pencils (9000, Lumograph, Palomino, Mono). Price and exchange rates: March 2010. I would like to thank Kent from Pencilog for the Dong-A Fable used for the comparison.